Core to Camden Catholic’s mission is developing leaders in the Catholic tradition in order to empower students to define their purpose, to serve others and God, and to develop creative solutions leading to a just society. 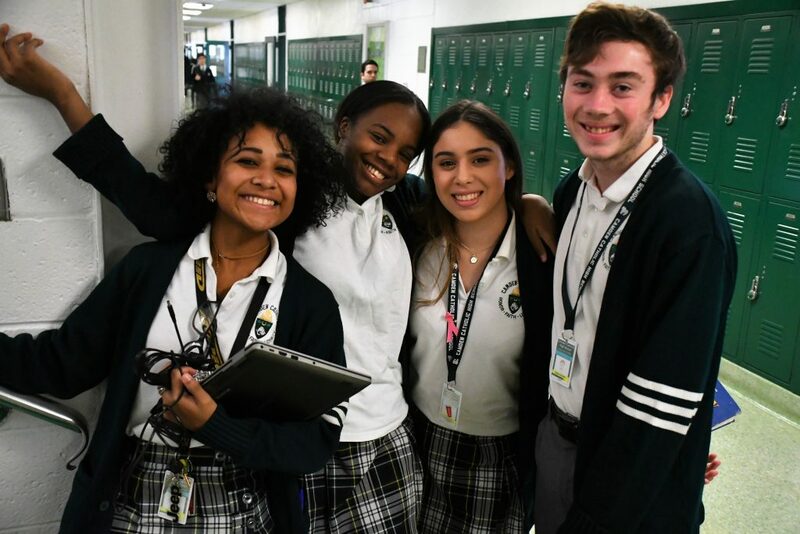 Camden Catholic High School recognizes that for students to be successful leaders in the 21st century economy there are a set of skills and competencies that students need to develop beyond the fundamental lessons of traditional education. Based in the research of Catholic Leadership Principles, Positive Psychology, and 21st century skills, the Leadership Academy provides students with an array of Leadership Academy programs that enable students to build this additional skill set. Teach content outside of the traditional educational curriculum founded in the field of Positive Psychology and the 21st century skills and that have been proven to help students maximize their potential and the potential of those they lead. Enhance students intrinsic motivation by empowering students with the opportunity to chose the focus of their Leadership Academy training based on their passions and interest. Provide students with experiential learning opportunities to see the application of the content in the real world. Students immerse themselves in the content outside of the traditional educational setting. Enable students to collaborate and create through project based learning. Students apply the content they learn to create goal oriented outcomes. Assist students through reflective practice to help students internalize the lessons learned and further develop their relationship with God.